Nice post. I've always wanted to know where the Durham Drug Co. was, the man who built my house in 1950 was a Mr. Casteele who worked as a druggist there. I don't know anything else about him. Also, I have heard there was a Fitzgerald Office Bldg. somewhere in this block in the 19-teens with several African American professional offices located inside. Do you have any info on this? Thanks Victor - I don't know the building you are referring to right off, but I'll look into it. Do you know if it was in the same block of Main St. (i.e. same (north) side of the street?) I wonder if the building was connected with the Fiztgerald's of West End. I'm going to be working my way east on Main/CH/Morgan/Parrish etc., so I'll post on it soon if I can find something. Geez, more airbrushing of The Herald-Sun building out of existence. FYI: When Royal burned The Herald-Sun was located right next door. Its lot became the H-S parking lot. ONLY when The Herald-Sun left downtown did that building become the Bull City Business Center. Relax. I'm not trying to airbrush anything out of existence. Read my response to your other comment. I'm not sure why, given the detail I've attempted to put in this site, anyone would think that I was trying to intentionally not mention the Herald-Sun - ? I'm sure there are gaps, omissions, and errors on this site. I spend a lot of my free time trying to put this together, but my knowlege is definitely not perfect. In this case, I have been unclear on the timing of when the hulking brown thing was built and by whom, although I believed that I had heard in the past that it was built by the Herald-Sun, which only used it for a short period of time before absconding to the bypass. In short, I welcome new information to make this as accurate a resource as possible. No need to be antagonistic about it. Victor mentioned the Fitzgerald Office Building, which appears to have been located at the same spot along Main Street as the Durham Drug Company -- you can see it (unnamed) on the 1907 Sanborn map. Named for Richard Fitzgerald, it housed the Fitzgerald Drug Company, as well as a real estate office and lodging. Jesse Dodson was a partner in the business. The 1905 Hill Directory states that Dodson was manager of the drug store, treasurer at the (original) Lincoln Hospital, principal of the West End School, and lived at 903 South Duke. That address gave me pause (since today it is the address of the Budd House), but like many addresses in Durham this one has changed. Hard to tell exactly, but I think Dodson lived at the SW corner of South Duke and West Cobb Streets. I cannot find out much else about Mr. Dodson. Curious, given his clearly important position in the community. 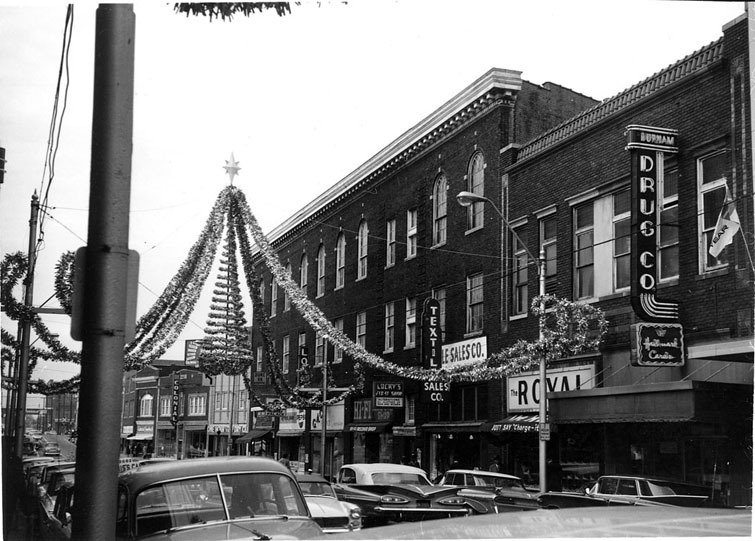 I think the Fitzgerald Building was actually located next door, and became part of the United Department Store, and later Belk-Leggett. I also believe that it was the building that partially collapsed during the mid-60s renovation. Looking west from West Main St., 1963. 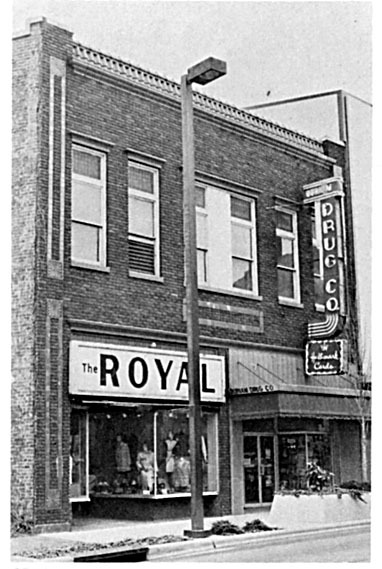 The Durham Drug Company and the Royal Clothing store were both longtime tenants of the building at 332 West Main St., a brick commercial building built in the 1920s, immediately to the east of the Piedmont Building. The earliest known retailer in the building was A.E. Lloyd and Co., a hardware store. The Durham Drug Co., established by Germain Bernard, followed soon thereafter. 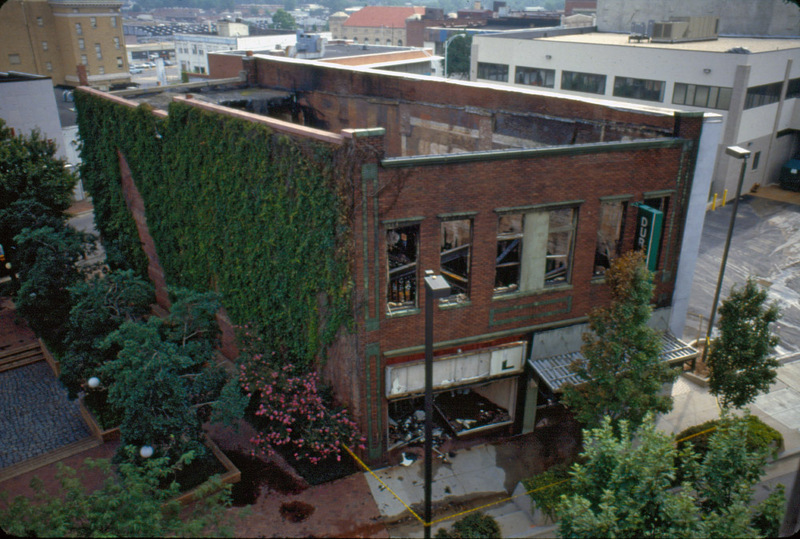 The building had entrances on both West Main and East Chapel Hill Sts. 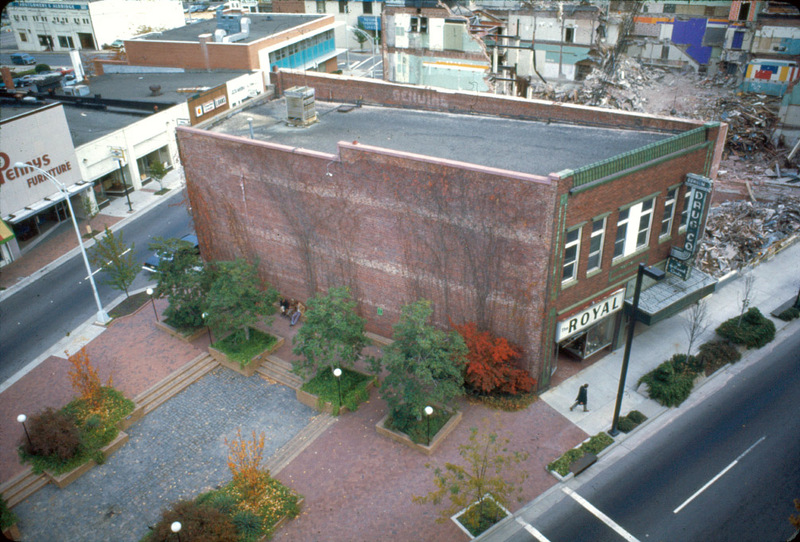 This structure, decorated with short parapet of glazed roofing tiles above the cornice, persevered through urban renewal and the demolition of the Piedmont building to its west in 1967. 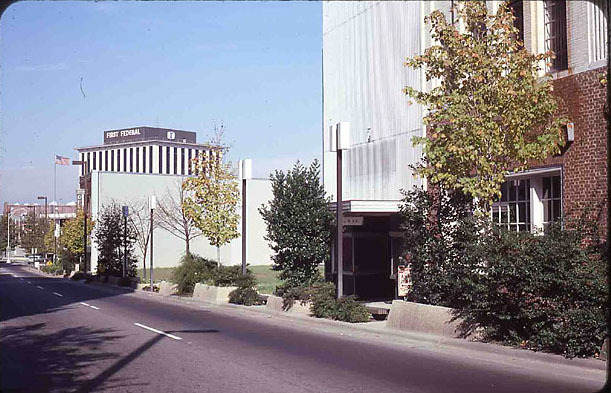 The Belk-Leggett buildings to its east were torn down in the late 1970s. During the late 1970s and early 1980s, it stood by itself in the mostly cleared eastern triangle of Five Points. Looking east from West Main St., 1979. The Temple Building and the building that currently houses Ringside are on the right. Looking northeast from Main St., 1979. In 1986, though, the building was struck by lightning and burned quite badly. From West Main St., looking north, 1986. From East Chapel Hill St., looking southeast, 1986. The building was then torn down. From W. Main, looking north, 1986. And it became part of the parking lot for the Herald-Sun, now the "Bull City Business Center". From Main st., looking north, 2007.